Iowa State Associate Professor Joe Muench's meticulous metalsmithing has been evolving for 40 years. Downloadable photo by Christopher Gannon. AMES, Iowa -- If you ask Joe Muench how long it him took to create a particular artwork, he'll probably tell you 40 years. After all, that's how long he's been honing his award-winning metalsmithing. And if you're lucky, he'll share his slide show — usually reserved for students and colleagues — because it proves his point. Muench's craftsmanship is a work in progress, beginning with a necklace created from a doorknob at age 13. Now an associate professor of art and visual culture at Iowa State University, Muench teaches metalsmithing and jewelry in the same classroom where he learned during the early 1980s. His diverse and uncommon artwork has won Juror's Awards and Best in Show honors at national and international exhibitions. It’s been featured in technical texts, reference books and metalsmith periodicals since his days as an undergraduate. It has prompted invitations to teach workshops on jewelry/metalsmithing techniques and tool making to fellow artists and craftsmen. This fall, ISU University Museums added one of Muench's most meaningful pieces to its permanent collection. "Blown Cube" is on display through Dec. 19 in the Brunnier Museum's 40/40 Exhibition, a showcase of significant Iowa artists on view during the museum's 40th anniversary celebration. The piece exemplifies signature currents that flow through Muench's work. It's simple but complex. It appears soft and fluid, but is hard and strong. It's traditional and untraditional. It's meticulously formed and flawlessly finished. It balances technique and art. It's challenging. It's personal. "It was challenging to find my voice," Muench said. That's due in part to the dialogue that takes place in Muench’s mind. It’s between his two “metal fathers,” the two masters who taught him. Chuck Evans, his metals and jewelry professor at Iowa State, and Heikki Seppä, his graduate school mentor at Washington University in St. Louis. Muench’s mother also studied under a master — she was a student of Christian Petersen’s at Iowa State during the 1950s. Muench’s doorknob necklace came out of a 9th grade art class and won an award. He never looked back. In Ames High art classes, he learned to motivate himself with challenges — like seeing how many solders he could get into one piece. His challenges now have evolved into something much more complex — like hand-forming sheet steel to resemble billowing silk fabric. "Nothing I do is easy," he said. "I seem to beat my head against the wall on every piece." Majoring in craft design at Iowa State, Muench learned technique from Evans, his “true mentor and close friend.” At Washington University, as one of the last graduate students to study under Finnish master Seppä, he learned metal forming and tool making. Seppä, who had worked for renowned Danish silversmith Georg Jensen, gave the field "new ways of thinking about metal — that included a Latinized vocabulary of metal forms, and essentials for understanding how metal moves,” Muench said. "I became a tool maker in graduate school. You can't buy many of these tools. Some – like chasing tools, which are used to work into the metal's surface from the front —are shaped very specifically and made very systematically. They're a lot of work. If you don't forge them right, they crack at the end of the tempering process," he said. "But when you're done, you've learned how to shape and how to see." Muench stayed in St. Louis for 15 years and taught metals at the nonprofit Craft Alliance Center for Visual Arts. He also worked for the St. Louis Art Museum. He performed the unseen gallery craft of designing and constructing mounting systems for priceless artworks, using all of his metal skills. In 1999, Muench accepted an assistant professor position in metals at East Carolina University. But two years later when Evans retired at Iowa State, Muench threw his CV into the national search for a replacement. "When I was 22 and working in the studio here I said to myself, 'I'm going to be teaching here someday.' And I was, some 20 years later," Muench said. Muench’s constant search for “ways to build sculptural forms” led him to an ISU Special Research Initiation Grant to study sheet metal tools, materials and methodologies of the automotive and aeronautic industries. The pivotal study has influenced most of his work since 2003. “I was interested in their uses of materials, shape and form. I was already doing sculptural work, but I began to study and apply their tooling and processes. This greatly influenced the resultant appearance and surface qualities of the sculpture,” Muench said. He explored new materials, welding processes and large-scale industrial tools. His goal technically was "to know what it's like to use the most delicate chasing hammer all the way up to the massive Yoder power hammer." In 2011, Muench experienced this while studying with renowned metal shaper Fay Butler in Massachusetts. "A lot of what I knew applied, but a lot didn't translate. I had a steep learning curve to figure it out. The forms I build are unmerciful. They have to be very precise," he said. Muench categorizes his work into three series. Two series utilize the traditional metalsmithing techniques of chasing and repousse. Chasing is working from the front into the metal's surface while repousse is working from the back into the surface. One traditional series is small-scale work ("Finding Porter"); the other large-scale ("Temporal Shift"). The third is Muench's “Auto-Aero” Series, hybrid work that combines traditional metalsmithing with techniques, tools and materials used by the automotive and aircraft metal shapers. This includes the Brunnier's "Blown Cube," "Rebounding Blue," "Proof" and "Yield." In 2005, Muench faced a new kind of challenge. After going through cervical spinal fusion surgery, he was diagnosed with two kinds of cancer that required chemotherapy and radiation. He continued teaching as much as he could. But by the time he was through the treatments, Muench was "shot." He was weak, exhausted and 40 pounds thinner. "'Blown Cube' was the first major piece to come out of the studio following that experience," he said. "And it reflects what I'd survived because it has attitude and fight. The cubic form has an internal energy. It's expelling, ramped up and to its capacity. It's blown." The piece has a sense of potency that is calculated, immediate and very personal. It also has a "stubbornness and tenacity" that can be understood technically or through the backstory. That determination radiates in the technical resolve revealed in "Blown Cube" and much of Muench's work of the past decade. Making the artwork appear soft, to belie the hard, resilient material it is made of. That's the challenge. "It's in my making style and the materials I chose. Steel is not particularly easy to use or form — it's fighting back. And I want to feel some resistance. Because once you have control of it, it is wonderful. But you have to show it that you have control. This physical engagement becomes part of the final work. That's important to me," Muench said. "Proof" 2009, hand-formed, fabricated steel, brass, concrete, paint. Photo by Ensley Photography. This sculpture records the idea of the transitory, stopped motion, stopped time. The viewer is presented with a paradox: a seemingly hard and resilient metal body appears to be soft and pliant, yielding to, yet surviving the dynamic forces of an external ballistic impact. This recorded observation alludes to the questions, challenges and fleeting nature of life, encouraging a momentary suspension of belief- what appears real exists for an instant and then may be gone. "This was the largest piece using the auro-aero techniques I had done to date. It appears simple, but not really. I was condensing it down to the most essential point. Part of making this was just to prove to myself that I could do it," Muench said. "Pillow Block #2" 2010, fabricated steel, married copper and brass. Photo by Ensley Photography. This piece won the Juror's Award at Iron Twenty Ten, a Juried Exhibition of American Blacksmithing. Muench considers this to be one of the most notable awards he has received. "This was in a field of other iron workers, blacksmiths so I sat in a unique position where I was coming from a metalsmithing perspective using steel and surrounded by people using traditional blacksmithing. So I'm an alien bird," Muench said. "This is one of my favorite pieces." Juror Anna Fariello said: "This piece presents the viewer with the duality of its material. On one hand, the piece is obviously made from a tough and durable metal; on the other, it appears smooth and soft as it s name implies ... This piece was created using traditional and non-traditional metalsmithing techniques. Rather than the hot forging process that is most commonly associated with ironworking, sheet metal was hand formed and fabricated. The corner seams were welded together and the entire body meticulously finished by hand to achieve the accuracy required for a clean, fluid, distortion free form. "Finding Porter" 2003, chased/repousse brass portrait, fabricated steel/brass casing, photograph, glass. Photos by artist. This piece is the second in a series of repousse portrait vessels. This one is based on the life of my matrilineal grandfather, Porter Kalsem. He was an Iowa farmer that lived and worked near Kelly, Iowa during the height of the depression. The chased/repousse top shows Porter in the midst of his work day, the interior contains an actual photograph of him as a young man. My intention is that my grandfather would represent, or serve as symbol for the lives of a common man and to honor the time and the rich culture in which they lived and worked. 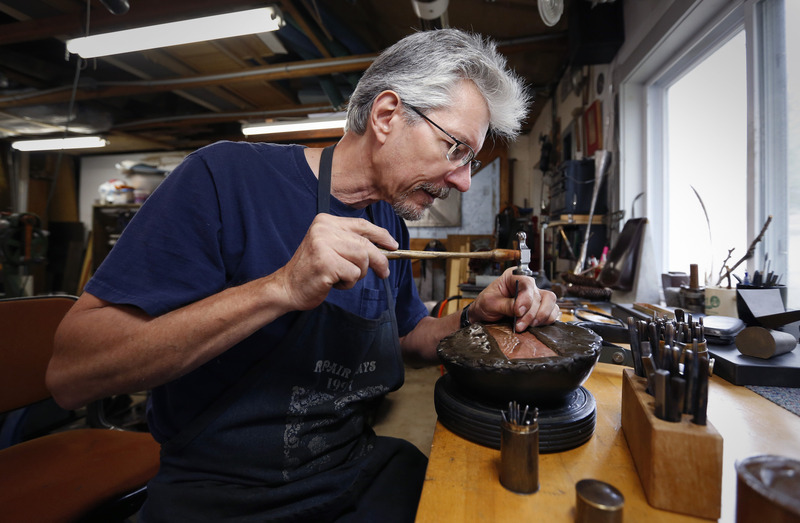 Joe Muench has been honing his award-winning metalsmithing for 40 years. Now an associate professor of art and visual culture at Iowa State, Muench teaches metalsmithing and jewelry in the same classroom where he learned during the early 1980s. His diverse and uncommon artwork has won Juror's Awards and Best in Show honors at national and international exhibitions. This fall, ISU University Museums added one of Muench's most meaningful pieces to its permanent collection. "Blown Cube" is on display through Dec. 19 in the Brunnier Museum's 40/40 Exhibition. The piece exemplifies signature currents that flow through Muench's work. "Blown Cube" 2006, hand-formed, fabricated steel, paint. Photo by Ensley Photography. "Steel is not particularly easy to use or form — it's fighting back. And I want to feel some resistance. Because once you have control of it, it is wonderful. But you have to show it that you have control. This physical engagement becomes part of the final work. That's important to me." "Hank" 2013, fabricated steel, brass, silver, chased portrait. Photo by Insight Photography. "Temporal Shift" 2009, chased/repousse panels steel, maple/steel frames. Photo by artist. "Rebounding Blue" 2012, hand-formed, fabricated steel, paint. Photo by artist. "Red Pillow Block with Bolt" 2013, hand-formed, fabricated steel, paint. Photo by Insight Photography. "Yield" 2014, hand-formed, fabricated steel, brass and paint. Photo by artist. "Pinch" 2015, hand-formed, fabricated steel, paint. Photo by Ensley Photography.